In my last 2 blogs was discussing about SAP Leonardo Concept & Design Thinking which leads to idea generation. The idea will converted into a prototype by using SAP BUILD. Before starting with the actual prototyping, one should compile all the findings which covered in previous blogs. User persona & POV from “Define”. Participated in openSAP’s IoT touch challenge. Main task of the challenge is to fulfill all 5 steps of Leonardo process with a actual prototype. Created SDS(Smart Drainage System) prototype for Brandon(persona). He is a city drainage specialist. Main task is to ensure the drainage system in the city is in good shape and planning for future demand. As a drainage specialist and adviser to city council he needs a way to monitor each drainage lines in the city for maintenance purpose & able to predict a problem before happens so that can maintain 99% availability KPI & far reduce the impact causing by drainage downtime to the city residence. With available information. Started to create an actual prototype with SAP BUILD under connected goods category. Advantage of using this tool for SAP related prototyping projects is, it is based on real SAP Fiori & UI5 and not just flat/dummy images. So when we drag and drop any elements(button, graph, etc), its not just an image, but the objects contains actual Fiori and UI5 elements. Hence, the clickable prototype serves as working representation & also functional spec for the developer and business analyst. Desktop, tablet & mobile compatible. 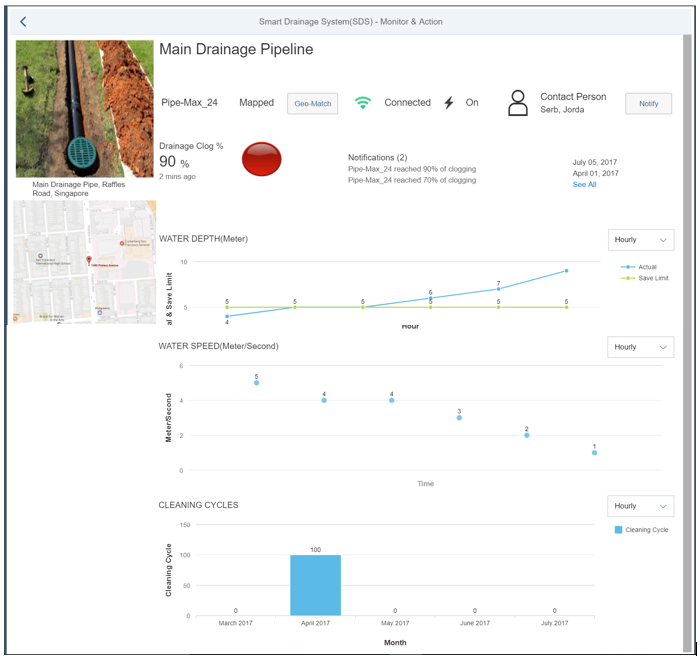 Below is a quick screen captures from my SAP Leonardo prototype build from SAP BUILD, “Smart Drainage System(SDS). SAP BUILD also caters for SAP Leonardo’s 5th and final phase, testing. A survey link can be created within the platform for a prototype and share with anyone to collect feedback. By sharing the link of the prototype with few questions. This will serve the purpose on SAP Leonardo’s final phase, testing and collect input for iterative improvement. End of series. From SAP Leonardo concept, all the way to hands on prototyping and testing. Hope the blogs have given some idea on the new buzz word. Sasitharan – Good proto type on BUILD. Thanks for sharing. A perfect Intro. Keep blogging ‘Sasitharan’. Thanks for the sharing post. i am interested to learn SAP Leonardo.Please guide where we can practice above prototype. Give me some guide lines.